We have just witnessed a wicked political pivot across our country. Gov Palin said in her interview that this win is a clear message that the people of America are taking their country back. Further, she reiterated her message of small, limited government, and market-driven solutions. When asked about the “Tea Party movement versus the Republican Party,” Governor Palin responded that they should not be viewed as competitors — that the Tea Party movement is represents the same planks the Republican Party should represent. Mr. Brown Goes to Washington… In a Pick-up Truck, No Less! Congratulations to the new Senator-elect from Massachusetts! Scott Brown’s victory proves that the desire for real solutions transcends notions of “blue state” and “red state”. Americans agree that we need to hold our politicians accountable and bring common sense to D.C. Recent elections have taught us that when a party in power loses its way, the American people will hold them accountable at the ballot box. Today under the Democrats, government spending is up nearly 23 percent and unemployment is higher than it’s been in a quarter of a century. For the past year they’ve built a record of broken promises, fat cat bailouts, closed-door meetings with lobbyists, sweetheart deals for corporate cronies, and midnight votes on weekends for major legislation that wasn’t even read. The good citizens of Massachusetts reminded Democrats not to take them for granted. Americans cheered for Scott Brown’s underdog campaign because they viewed his candidacy as a vote against the Democrats’ health care bill. You know that there’s something wrong with this legislation when opposition to it inspired a Republican victory in a state that currently has no Republicans in Congress and last sent a Republican to the Senate nearly 40 years ago. Clearly this victory is a bellwether for the big election night ten months from now. In the spirit of bipartisanship, let me offer some advice to the Democrats on how to stem this populist tide. Scrap your current health care bill and start from scratch. We all want true reform, but government mandated insurance is not it. Scott Brown campaigned against this top-down bureaucratic mess. We need common sense solutions like reforming malpractice laws, allowing people to purchase insurance across state lines, giving individual purchasers the same tax benefits as those who get coverage through their employers, and letting small businesses pool together to provide insurance for their employees. Focus your efforts on jobs, not on job-killing legislation. Such a change in approach would show Americans that you’re listening. My best wishes to Senator-Elect Brown. When you go to Washington, may you never forget the ordinary citizens you met while driving that truck through the great Commonwealth of Massachusetts. Way to go Senator-elect Brown! 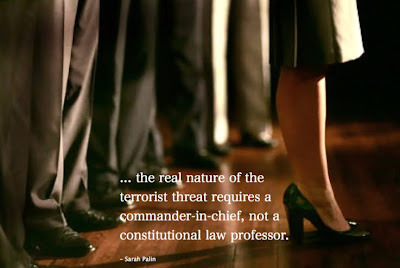 Obviously, it’s those final words, the fact that Obama needs to “….recognize that the real nature of the terrorist threat requires a commander-in-chief, not a constitutional law professor” are what stand out. This caused us to further discuss this in a piece called: President Obama To Sarah Palin: Where You Lead I Will Follow! Not long after, Liz Cheney’s group Keep America Safe released this video that highlights just how dismal it all truly is for those of us who would actually like a President that cared about keeping us safe. Pretty powerful statement. Remember how the democrat/communists and the media (yes, I know, same thing) were caterwauling because it took President George Bush a whole seven, eight minutes to respond to the attacks on September11, 2001? If you remember, President Bush was in Florida reading a book to a group of school children when he was told. Now rather than run out, hair on fire in a panic, the President chose to calmly finish the last pages of the children’s book, then calmly excuse himself to handle things. Obviously that was the right thing to do. Over the next few hours there would be plenty of fear, anger, and confusion. It would have been irresponsible on his part to add to it. But to this day, the moonbats on the left whine about those seven or eight minutes. Here we have a president that waited 97 hours before addressing what was the third high profile terrorist attack on American soil since taking office! No way in hell was this guy about to have his vacation interrupted. We’ve seen a radical Muslim terrorist kill a soldier at an Arkansas recruiting center, something the Obama friendly media rushed to cover up. Pamela Geller has the story though at her popular Atlas Shrugs website, here. And of course, we’ve had Hassan, who was obviously an al Qaeda “sleeper” who killed our troops in the attacks at Ft Hood, Texas…the largest armored military base in the world. Obama and friends have rushed to quickly shove that story out of sight and out of mind. Now we have the Eunuchbomber who was only a failed fuse away from not only killing everyone aboard the jetliner, but who knows how many hundreds, or thousands on the ground as this thing crashed into the densely populated area below. Of course, Obama’s crack team were all on the job assuring us that “the system worked!” It would be great sketch comedy if this wasn’t serious business. To say the system failed would be quite possibly the understatement of a lifetime. I mean the terrorists’s own father called and told us his son had been radicalized by the Religion of Piece! This of course got me to reflecting on what a truly horrible, inept, and maybe indifferent Commander-In-Chief Obama is. I looked back at a couple of articles I wrote earlier as an example of the man’s unfitness for duty. The first one involves the heralded and much celebrated Alaska Defense Force. This deal was so petty, that if I didn’t know better, I’d say this was a direct shot by Obama at Sarah Palin. force in the state of Alaska, as well as a reserve military unit. They receive full military training, and are under the direct command and control of the Governor of Alaska. This issue in question involves living ADF members who fought the Japanese in WWII. Alaska was invaded by the Japanese in WWII, and brave members of the ADF held them at bay. These brave men were mostly Native Alaskans, and they fought without receiving any paid compensation whatsoever. For years Alaskans had fought to, at the very least, get these brave men some retirement money from the government. They finally succeeded. Early in the year, Barack Obama put a halt to this. This was Sarah doing what a Commander-in-Chief does, taking care of her troops. You can read more background on the ADF, their WWII history, as well as the history of the efforts to get these brave Alaskans honored and paid here. For Sarah, as well as both Alaska Senators and the one Congressman from Alaska all teamed up to fight this. We learned just before Christmas that the efforts of all had paid off, and they had defeated Obama’s attempts to deny these brave men their due. While I am not pleased with some of the enormous and even reckless spending our government seems to be determined to push forward, I received via Facebook and Rep. Don Young’s site notification that H.R. 3326 has passed. The price tag for this is $636 billion, which is nothing to laugh at, but it secures several things in the area of defense, one of which is the status of the remaining Alaska Territorial Guard members. It was with great concern that I learned of the recent decision by the Department of Defense to rescind the program that currently provides retirement payments to veterans of Alaska’s Territorial Guard (ATG). This unfortunate decision was made without any notice to those affected and will cost a group of elderly Alaska veterans a significant portion of their retirement income at a time when the cost of living, particularly in rural Alaska, is substantially higher than in the rest of the United States. In 2004, Congress fully vetted this issue and decided that service in the ATG was the same as military service. This is the right and proper way to honor these brave individuals who answered the call of duty during times of great national peril. Prior to World War II, Alaska’s territorial Governor was authorized by Congress to organize a two-branch military response organization – the organized National Guard, and the ATG, which would mobilize to help defend Alaskans in the event of an invasion. An estimated 6,600 men and women, mostly Alaska Indians, Eskimos, and Aleuts, responded to that calL Instead of hunting, trapping and fishing, they patrolled rural Alaska and served as the eyes and ears of the Army for more than five years without pay and benefits. It took our nation almost 60 years to have these defenders of our territory honored for their time in the ATG, and for their service to be counted the same as federal military service. While most died waiting for their recognition, some have survived to receive their honorable discharge from the United States Army. Now they are being told, again, that their ATG service is not worthy of federal recognition, and that is not right. These people are our heroes. The stellar service of these mostly rural, mostly Native, soldiers is to Alaska today what the service of the militia at Lexington and Concord was to New England. I urge you to remember all that these valiant members of the ATG sacrificed while defending this country and ask that you reconsider this decision and immediately reinstate the retirement benefits that Congress already recognized in 2004 and that these heroes have certainly earned. 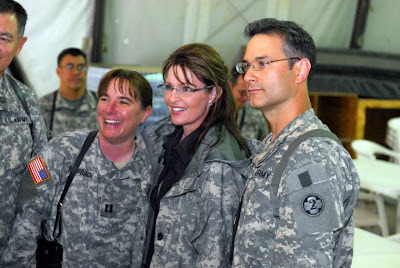 This was Sarah Palin again doing what a Commander-in-Chief does, taking care of her troops! In another piece, that just happened to involve Alaska, as Obama stopped there on his way to kick off his “Bow to the World’s Other Leaders Tour“in Asia, to refuel Air Force One. This time Obama refused to be filmed with an Air Force F-22 Raptor, the pride of Elmendorf AFB. This was a real slap in the face to the brave men and women who serve there, and around the world. Of course, this was all political because Obama was one of the ones behind the efforts to kill off the F-22. We wrote about this in a piece called Pathetic: Barack Obama Refused To Be Photographed With F-22 Fighter. Obviously, Obama is not all that fond of the military. Of course, he’s not wild about the CIA either. I still haven’t heard him address the attack on one of our key CIA stations, or the deaths of those brave agents. As we are talking Commanders-in-Chief, I thought it would be nice to offer some contrast. We wrote a piece back in June, The ‘Cuda Goes to Kosovo that talks about her trip to visit her troops. By now we have all witnessed how Obama acts around the troops, and it’s rather obvious how he feels about them, and well…the American people…since he obviously isn’t all that into the whole “national security thing” especially if it is going to cut into his Hawaiian vacation time! Got get that golfing in, no matter what! We wrote another story about Sarah welcoming home her son Track and the rest of his Stryker Brigade Combat Team from Iraq this past Fall. Sarah was honored as the Brigade’s “senior mom.” You can read about it all here. 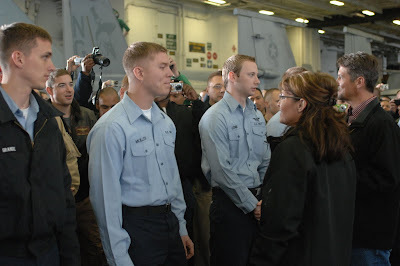 As Commander-in-Chief, Sarah Palin attended every deployment ceremony and was at the airport to great every returning group of soldiers, personally thanking them for their service and sacrifice to this great nation. One has to ask, looking at how these two have conducted themselves as Commanders-in-Chief, looking at their actual record and performance, just who would you want to be your Commander-in-Chief? Governor Palin will be one of the featured authors at the Celebration of Reading event in Houston on April 22. Barbara Bush and former president George H. W. Bush will be hosting the event. They’re kicking up their heels at the Barbara Bush Literacy Foundation for Family Literacy offices with announcement that former vice presidentialcandidate, Fox News commentator and author Sarah Palin will be among the published writers of note to make presentations at the Celebration of Reading. Politics notwithstanding, those who’ve seen Palin in person report that she is a charismatic figure not to be missed. And if you loved Palin going rogue on the campaign trail, we bet you’ll love her even more as she comments on her life and reads from her book, Going Rogue. Mark your calendars for the April 22 benefit at the Hobby Center for the Performing Arts…. The event regularly packs the theater and brings in close to $2 million annually.